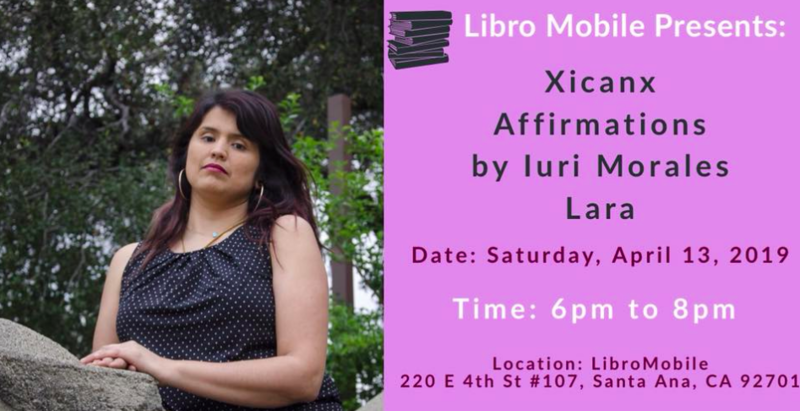 You're invited to enjoy poetry & spoken word at LibroMobile for the chapbook release of XIcanx Affirmations by Iuri Morales, a chapbook on spirtual affirrmations and femininity. I am honored to participate as a feature poet. This is a free event and ADA accessible. What's the difference between surviving and thriving? When I was a kid I used to not recognize myself in the mirror. I would get so consumed by my emotions and the ones of others I would legit have out of body moments. I looked it up recently and this is something called dissociative disorder. I didn’t know this behavior wasn’t normal until I laughed it off once in my early 20’s and a friend reacted with concern and told me to be careful and ground myself physically on the earth. 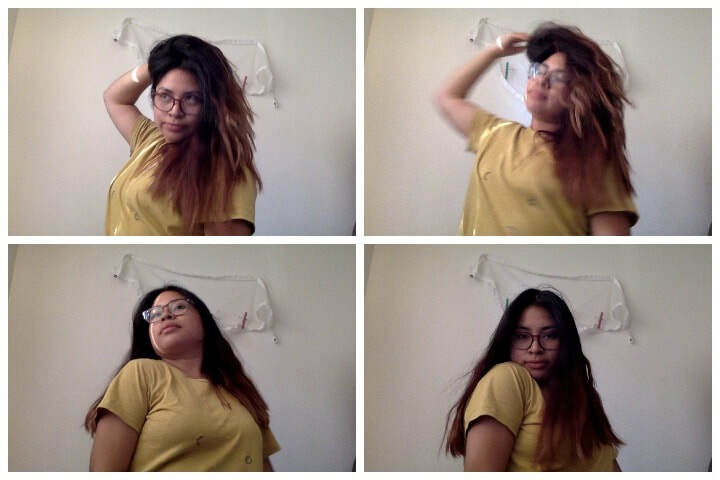 I also think I take pictures of myself sometimes to remind myself I am flesh and bones. This is just one of the many symptoms I’ve experienced in my life. Long after experiencing traumatic events I have felt like there is something wrong with me. I thought, "how could I not see all the wonderful things happening in my life?" and "Why is it so easy for me to focus and even obsess on the negative?" Added to the recipe I’ve realized survivors guilt is real and it comes with ugly self-sabotage and negative self-talk like: “I’m not worthy” or “this is too good to be true”. I must preface this with saying there is absolutely nothing wrong with surviving. If you are reading this and surviving I want you to know you are amazing and I am so happy you are here. As a survivor of violence I know it takes a lot and I commend anyone who is surviving any kind of violence at this moment. There are many ways people cope with the discomfort of surviving. If you have ever met someone whose knee jerk reaction is to complain, sulk, or get angry and doesn’t seem to shake it off, it’s because it’s familiar to them. It’s what they know how to do & it gives them a sense of familiarity. It’s survival mode. It’s kind of like the hamster in the hamster wheel. It isn’t comfortable at all, but it prevents them from actually acknowledging that there is something wrong. As someone who has experienced this, I can attest that it’s exhausting. With time I’ve realized the patterns I kept repeating were kind of like my auto-pilot. If it wasn’t one thing, it was another thing. Same lesson, same tactics, same results. I had to hit rock bottom and seek a a therapist who told me I was allowed to make mistakes but growth would only come from making different mistakes, to begin to understand I had a part in how my life would be. Healing is a choice and a commitment that is 100% not what the self-care marketing industry wants us to believe. On this journey of healing I’ve found many forms of art practice. 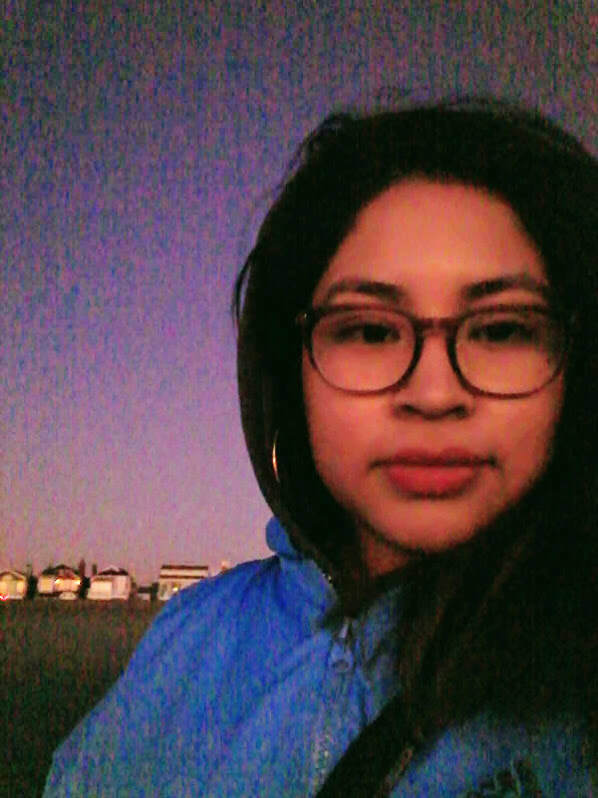 Last year I found a wonderful virtual space called Winter Tangerine where I took part in a week long writing workshop on finding my joy. It was difficult to write about joy for a whole week for some reason. This is when I started to ask myself, what’s the difference between surviving and thriving? As I see it now, it’s understanding the value of living a full life because I don’t have to be or do anything different to give myself the best chances. I understand that not every day will be superb or horrible. Surviving is getting through the day. Surviving is defending your freedom to exist. Surviving takes agility and endurance and patience. Surviving is a necessary step and it is a difficult one. But thriving takes another level of discomfort in many ways, because it takes stripping oneself of coping mechanisms that helped with surviving and filling in those gabs with new habits. That is no easy feat! What I'm finding in my research and practice is we cannot thrive alone. We need one another to embrace one another, to hold each other accountable, to ask for help and to strive for a better future. Surviving, as I am learning, is a condition of capitalism. We are all trying to survive and stay afloat on an individual level. Thriving, is something that is counter-cultural. Thriving takes community and trust and imagining a future for ourselves and one another. Thriving is participating in co-creating the life we want. Thriving is seeing the potential in what is. Thriving is realizing there is no mistake because..
You were meant to be this magnificent, amazing, silly, wonderful human being. Thriving is finding your joy, and spreading that as far and wide as possible. I am not ashamed that sometimes I do the bare minimum to survive, but at the end of the day, I choose to make space to plant a seed of freedom. Whether it's through meditation, dance, taking vitamins, listening to music, reading ext. This playlist I call: 90’s Baby is just one tool to replenish my joy. How about you? I’ve been listening to a podcast called Pink Lemonade Podcast where in about 10minutes Whitney sums up plenty of wisdom and anecdotes. I recommend listening to the one about self-respect. Dr. Amanda Kemp's work on racial justice! 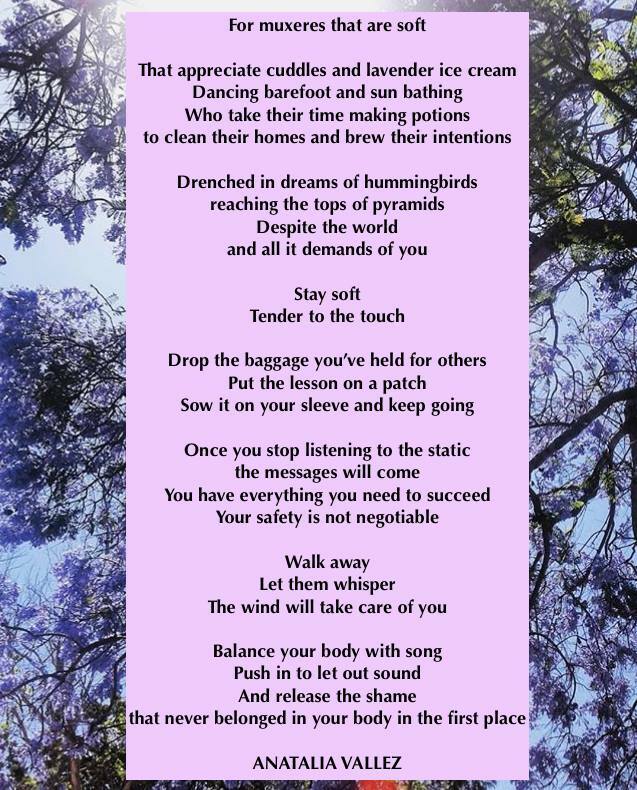 Honoring Women's History Month and National Poetry Month with this poem. ​The other day I dreamt I was embracing a good friend. We were laughing and I could feel their warm cheek on my face. I was blushing. I woke up feeling so happy and grateful to experience such uplifting relations both in the dream world and in my waking life. I’ve always valued friendships, but this wasn’t always reciprocated. I don’t know about you, but friend heartbreak is harder for me than romantic heartbreak. We live in a society that is constantly selling us the idea that heteronormative monogamous relationships should be our main source of love. This is so twisted, unrealistic and untrue. 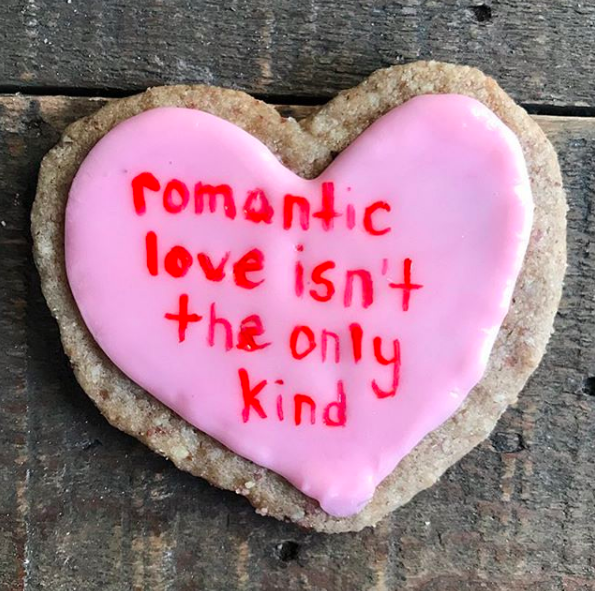 Every year around Valentine's Day I like to read bell hooks, “All About Love” and in this book she defines love as "a combinations of trust, commitment, care, respect, knowledge and responsibility". Every week I like to check in with myself and I offer the questions: what did I give? & what did I receive? Sometimes I get more than what I give and sometimes I give more than I receive, but most weeks it's balanced. Love is learning and unlearning parts of yourself as well as others. I invite you to check in with your energetic investments. Who are you forgetting about? Who do you take for granted? Who do you owe a phone call or a hug? And if you find yourself in the Los Angeles area, please come out and support the 10 Minute Play Festival at Teatro Frida Kahlo running Feb 1st-17th. I get so share two beautiful pieces about friendship in the festival with some fabulous femmes. My wish for you is summed up in the words of Nayiraa Waheed: "May love find you even when you are specifically, strategically, hiding from it". It is always difficult to say goodbye to a show you loved so much. Being a part of Los Faustinos was truly an experience like no other because of the fantastic cast, story and timing it happened to take place in. I found myself emotional and discovering something new at every performance. I was never ashamed or mocked for being vulnerable-- if anything, we encouraged one another as cast members to honor the story with all we had. There was a moment in one of the rehearsals where Roberto, our fantastic director, called up a couple of actors (including myself) and started talking about how ensemble work is all about catching one another if we fall. When he asked us to stand in two rows facing each other and extend our arms we all knew something was up. He teased us saying he wouldn't do such a thing but our instincts kicked in and we braced ourselves for a trust fall. The funniest part was that when Roberto leapt into our arms he didn't feel heavy at all. "Acting is about doing" he would often say. In all the performances I realized I was acting fast, following my instincts and bracing myself just like he had demonstrated. Although I have many favorite moments, performing "In The Messy Right Now" which encapsulates the message of the story and the importance of embracing the now, always touched my heart. We will never be able to relive the performances, the laughter, the tears we experienced in Los Faustinos, and that is what makes it so special. 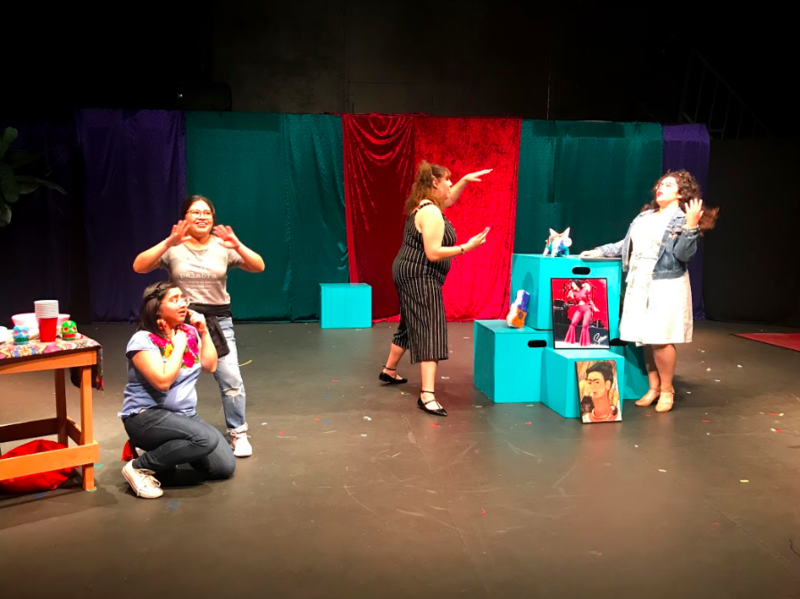 Santa Ana (where this play took place) is one of the most rapidly changing cities due to gentrification and Orange County is experiencing so many waves of social-political disenfranchisement it feels overwhelming for many families struggling to survive. We cannot avoid change sometimes, but this should not give away our power to embrace the present moment. If we get too caught up in what should/shouldn't be, it takes away from precious time we have now. Yes, the now can be messy and there is so much uncertainty in the world but nothing is guaranteed for us..which is why we must be here right now for one another and for ourselves. Overall, I know all the hours we spent rehearsing showed in the limited performances we had and the the rave reviews we got from audience members coming out from near and far! I don't think anyone who signed up for this play could foresee how much of a gift this show would be, but I know all of us will take a little piece of Los Faustinos with us. I mourn the end of this show knowing the magic co-created in that space will continue to permeate in other places and spaces. Interested in getting the latest from Anatalia in your mailbox? Please enter a valid email. You may be removed from this newsletter anytime upon request.